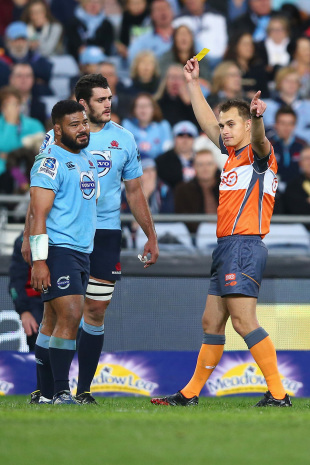 Waratahs back-rower Stephen Hoiles has called for video review stoppages in rugby to be limited, describing them as a blight on the game. Hoiles was frustrated by a number of delays during the Waratahs Super Rugby game against the Crusaders in Sydney on Saturday night. The officials checked on a variety of incidents including some shoulder charge style tackles. "I thought the stoppage of the game, I think that's a blight on the game, to be honest," Hoiles said. "If you want to be really technical every cleanout involves a shoulder at some stage." He suggested officials were possibly calling for the stoppages because they were concerned about making mistakes. Hoiles felt there shouldn't be stoppages to check for possible instances of foul play. He said some things could be reviewed after a match and if the facility was used in a game, there could be a cut-off time, with just a couple of looks at an incident. "If we're just continually stopping and going up to the video ref, it's going to turn into the NFL," Hoiles said. "[Rugby] league is going down that path now with players not staying down and not letting referees or third umpires make decisions. "I just find it disappointing. I don't think it needs to happen and it's no individual or team's tactic. It's just probably referees a bit concerned that they are going to make the wrong call; [that's] human nature. We [the players] make mistakes, we drop the ball, we give away penalties. "The referee is going to do the same. I don't think it needs to be the stage where a game gets dragged on by 10 minutes to pick up the stoppages." Veteran blindside flanker Hoiles wasn't concerned he could lose his starting spot next week, with Jacques Potgieter declaring himself fit to return from a sternum injury. "We need him back in the side, he's got that different style of footy," Hoiles said of Potgieter. "I look forward to having him back. Whether I stay at No.6, that's completely out of my hands. To be honest, I'm at the stage of my career where I'm really happy to be part of the team and I want to contribute no matter what."